When I visited Garden Place Senior Living of Columbia. I wasn't too impressed with the rental units. Very small and compact. Would be very hard to access with a wheelchair. And the bathroom was even smaller. Even though the shower was a walk in with a bench inside, still was too small for seniors who require mobility devices. And for meals you have to get a tray and go through the food line. Now I think this is more of housing for seniors who don't require any mobility devices. However, I was impressed with the beautiful gardening and landscaping which happen to surround the building. Even though the building was old, it was very clean. And the hallways were very narrow. But they do offer activities to enjoy. Like coffee hour, chair exercises, and off-site social gatherings. And their prices aren't high either. The best way to get to know a community is by scheduling a tour. 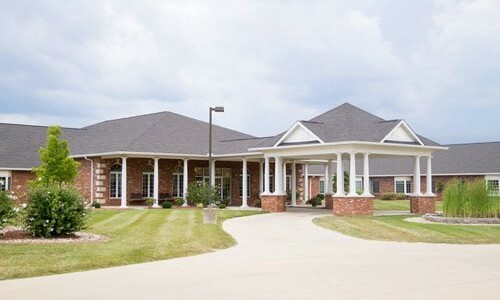 See the facilities, meet the staff and residents, and get a feel first hand what it's like to live at Garden Place Senior Living - Columbia Community Assisted Living. If you are searching for a retirement community where the fish are plentiful and the activity calendar is always full, than Garden Place Senior Living of Columbia is the perfect fit for you. When joining our community, you will quickly discover how easy it is to make friends with fellow residents and staff, and with our location close to Hwy 255, it is easy for family and friends to visit. Creating an engaging and lively home for seniors is the philosophy of Garden Place Senior Living. We are an Illinois-based company providing independent and assisting living options for seniors. Our communities are created to serve the people who work and live in the local area. At Garden Place Senior Living of Columbia, your lifestyle begins with choosing from our three senior-friendly apartment floor plans. A kitchenette and views of the landscaped grounds are found in each apartment, and the community's single-level layout makes it easy to navigate. And with our community being pet-friendly, you are likely to see four-legged friends walking down the hall. Each day we have a variety of activities that will keep you active and learning new skills. Our activities are designed by residents and staff so everyone is sure to find something that appeals to their interest. When you want a quiet moment, there is an on-site lake where you can fish or a library that has comfy chairs, perfect for an afternoon of reading. Though your apartment has a kitchenette, the responsibility of cooking is on us; every day the community dining room is filled with the smells of home cooking. Other household chores that we take care of to create your responsibility-free lifestyle include driving to appointments, housekeeping and laundry. A full suite of health care services are available at Garden Place Senior Living of Columbia. We offer on-site visits for podiatry services or medical consultations. X-ray and lab work services are also available on site. For residents needing assisted living services, our caregivers provide bathing, dressing and personal care assistance. Garden Place Senior Living at Columbia - where care and community combine to create a lively and engaging home for seniors.